These two photos were in with the following letter. It is possible that the woman above is "Minnie". 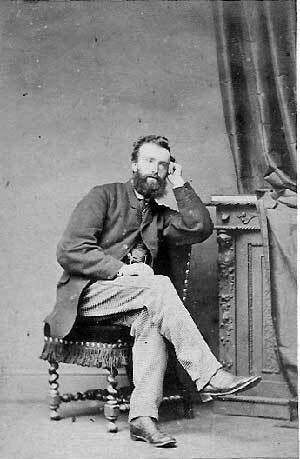 This is possibly John Maitland Reid. I was glad to hear you are improving & hope you will soon be quite well & able to use your arm. It has been very hard on you all this time. I am sorry to hear about Ann  , I hope she will be spared suffering. Please thank Mattie  for her letters. It is very pleasant for you to have her & Mr Skuce  with you they are both such pleasant company. Martha Brown  called on Tues Evg She & Willie  are in Glenesk  when the family are all away. Miss Tombs  took Maritoe  , Eileen  & Mr Ryder  on a tour. Mrs B. is very fond of Mr Ryder. She says Mrs Gilmore  is poorly with falling of the womb & has to wear a Ring. The Horse Show promises to be very grand this year. My fine people are coming as usual from Co. Wexford, but where to put them is rather a problem. Mr Ledwich  said he would sleep at his mother's & give me his room. I was very sorry about Peggy Reed's  husband. I hope she is left in comfortable circumstances. With my love to you & Jim  , Mattie & Mr Skuce. Mary (nee Menary) WRIGHT (1872-1946) of Gilford Castle. Ann who? Could it be Anne Jane MENARY? Martha BROWN. According to Eilie RYDER nee McBRIDE, she was a frequent visitor with her dog, Barney, at Glenesk. I suspect that we will find that she was related to Thompson BROWN and/or to Daniel Gunn BROWNE. She is described as being very tall and large boned, possibly afflicted with acromegaly. William BROWN This could be a son of Martha BROWN, or a husband. I know she had a son called William. In the 1918 will of Elizabeth BROWN, nee JACKSON, her sister Sarah GILMORE (nee JACKSON) was a witness. Her address was given as: Sarah Gilmore of Glenesk (widow) 24 Claremount Rd.,Ladymount, Co. Dublin. According to EIlie RYDER nee McBRIDE, this house was purchased about 1922 and sold in 1932 by William McBRIDE. Sarah (JACKSON) GILMORE lived there with her daughter Edith Eileen GILMORE who looked after the two McBRIDE children, William & Mary Francis so they would not have to go to boarding school. Eilie McBRIDE was there for a while going to kindergarden. Miss Tombs – possibly related to Florence Gertrude Tomb, wife of Herbert Evelyn BROWN, son of Thompson BROWN & “Bessie” Elizabeth JACKSON. Mary Francis McBRIDE (1909-1931) a brilliant student. She picked up the nickname "Marito" because her "Aunt" Mary MANDERS (nee DONALDSON) said there were too many Marys in the family. When she became ill, her mother thought that she should go to Switzerland to recover, but her father said "No, there have been enough dives in the dark". She was nursed at home and died under the care of family and friends. Eile Ryder has an informal portrait of her. She had contracted TB when she was a second year medical student. Edith Eileen GILMORE (1890-1977), daughter of Eliezer GILMORE & Sarah JACKSON, married George William RYDER July 7, 1930. 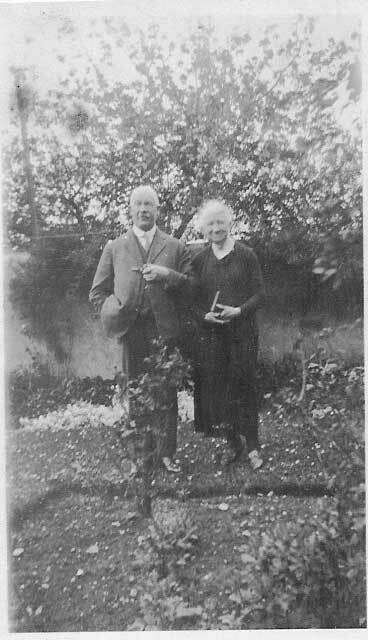 George William RYDER (1903-2000), married firstly Edith Eileen GILMORE (1890-1977) and secondly in 1978 Eileen Edith McBRIDE (1920-)after the death of his first wife. Probably Eliza Emily GILMORE (1846-1938), wife of Andrew Coulter Bradford JACKSON and age 83 at the time of this letter. James Francis WRIGHT (1874-1954), husband of Mary MENARY of Gilford Castle.